Birch has been used in many different cultures as a tonic to promote healing and continues to be used today in cosmetics, flavorings and therapeutically as an essential oil. Native Americans would drink a concoction made from the Sweet Birch bark, very similar to “root beer”. In Europe ancient people would use the buds of the White Birch as a tonic for hair and skin problems. In Scandinavia, birch twigs would be added to the sauna to stimulate circulation. Today we use birch in many of the same way as an essential oil. The buds of the Betula alba, or White birch are steam distilled to form the essential oil. The tar is distilled from the bark and “Pine Tar” (Birch Tar) and was well known to older generations for use in skin and hair treatments. It can still be found in healing lotions and potions for eczema and psoriasis, and in shampoos for dandruff and scalp irritations. Many men’s colognes have a base of birch tar as it has a woody, smoky, “Russian leather” type of smell. 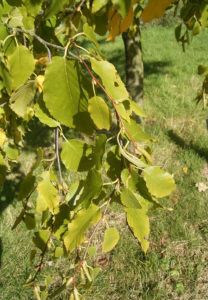 In aromatherapy massage, birch is wonderful for all skin complaints. As mentioned before, it works well to soothe eczema, dermatitis, psoriasis and congestion in the pores. A few drops mixed in shampoos will control dandruff and stimulate the scalp to encourage stronger healthier hair. Birch does come with a caution. Some skins are very sensitive so birch essential oil must be mixed in a carrier or skin irritation could occur. As with most essential oils, never apply directly to the skin as they are too concentrated and can burn superficially. Another therapeutic property of birch is its ability to assist in reducing inflammation of arthritis, cellulites and edema. Birch stimulates the circulation and encourages detoxification of any accumulated poisons out of the cells. In a tonic form it promotes sweating and evacuation of toxins. As a diuretic, birch supports kidney function, thus releasing built up and stagnant fluids in the body. It can also be helpful with urinary tract infections, especially if the oil is placed in a warm bath and soaked in. Muscle aches and pains can be relieved with massage or a warm bath in which birch essential oil mixed with bath salts or bath oils is added. Birch is a very uplifting oil when burned in an aroma lamp and can awaken and enliven the senses. It has the ability to promote mental clarity and cleanse out cluttered unwanted thoughts. It seems to be able to move stuck thought patterns along, so that one can be free of the repetitive recurring chatter that the mental body obsesses over. It allows for self-acceptance and re-evaluation of one’s one thoughts towards self. Like looking in a mirror, birch asks us to examine who we are and how we appear to ourselves. When mixed with some of the deeper, more meditative oils like frankincense and sandalwood, birch can bring us into a depth of self-introspection, where release of deep patterning can be achieved. So next time when you are in a health food store, see if they carry any “Pine Tar’ products, then enjoy the healing gifts of birch.